Also I'm wondering if you could take a 2013 CMAX Energi and exchange the HVB with a new 2019 Fusion Energi HVB with extended capacity to get 25+ miles on a charge. Did Ford improve cooling on newer CMAX's? Edited by ptjones, 20 September 2018 - 07:33 AM. If you have an Energi, I think you can fit the new Fusion Battery in it as I thought I heard the size of the battery is the same but just denser. If you have the hybrid, you would need to replace trunk parts to make room for a 5x bigger battery pack. Right now I get in the 30's for a charge on the stock Cmax battery. If I get the Fusion one I'm confident I should break into the low 40's range. The 2019 Fusion Energi has a 9 kWh battery in the same physical size as the C-Max's 7.6kWh battery. Would/could this increase two/three years from now with help from a third party vendor? I talked to GreentecAuto and they were contacted by a Chinese Company that said they could make the batteries, but they didn't want to go outside of the country. The cells are very expensive unless they are made in large volumes. As time goes by new things are coming out all the time. If I could have gone to all the talks they had at the EXPO I might learned some thing new. I'm going to research this some more to see if you can just replace old Energi HVB with 2019 one, it would be cool it you could. If I can fit the Fusion battery in mine I'd do it in a heartbeat, after the 2017 battery goes bad. So might be several years but of course why not upgrade to extra range. I think it will work without any software changes, the battery will just drain slower and you will get the added range. Will take longer to charge but who cares. Considering my 2013 never figured out that my capacity had dropped (it always said it would take 6+ hours to charge, when it only took ~4), I expect the larger battery would work fine ... assuming it fit physically. 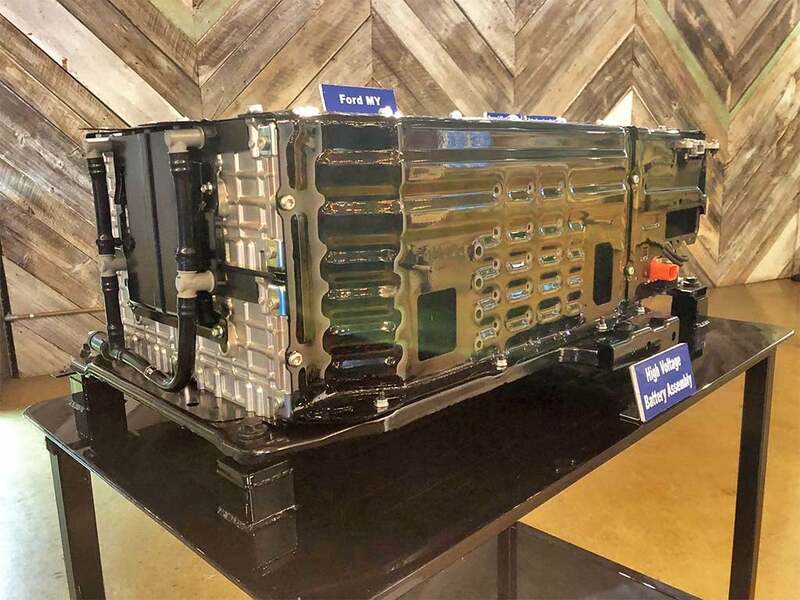 I found a picture of the 2019 Ford Fusion Energi 9kw battery. Please let us know if you found more information about the pack and whether it fits the Cmax! 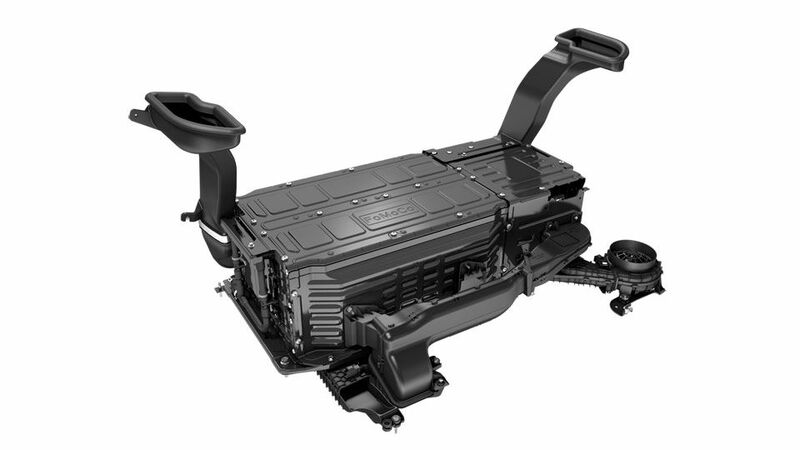 The photo of the "called" 9kWh battery looks larger and liquid cooled. Thanks for posting the pic, it helps to compare. It looks to me that the enclosure is very much the same. Likely same dimensions and certainly not liquid cooled. The picture of the 2019 battery does not include the plastic air vents. The hoses on the left are also there on the 7.4kW battery. Edited by olidx, 25 September 2018 - 09:33 PM. Yeah, the new battery has holes where the old battery has ductwork attached. I'm wondering if that is a Focus Electric HVB, It doesn't make sense that Ford would change the HVB that much. Edited by ptjones, 26 September 2018 - 09:50 AM. I assume you are referring to the actual cells pictured at the top of this post. In regards to that I'd be wary and try to confirm what came out of an Energi vs Hybrid model. If memory serves they either used different cells or I do recall something about the anode/cathodes used were significantly different to aid having a better discharge rate in the Energi vs Hybrid. If I can find my original source on that I'll post it. Edited by ptjones, 22 November 2018 - 09:00 AM. How about posting a link for this photo? This photo's angle is different than the other photo. It doesn't say anything about Fusion and it is way bigger than Fusion Energi current HVB. It might be the next gen of plugin battery or more likely Focus Electric which I believe is water cooled. I am not sure what you mean... The legend under the picture states "The 2019 Fusion Energi's battery pack stores 20% more power, boosting range from 21 to 25 miles." Ford parts dept. shows the same battery as 2018 but they couldn't give a part# because they need the part # off your 2019 FFE HVB. Not going anywhere there. Sounds like you can order a 2019 FFE but won't be available until around Jan. 2019. Stay tuned. Specifically, the capacity of the pack has risen from 7.6 kilowatt-hours to 9.0 kwh, courtesy of a new cell chemistry that's slightly more energy-dense. The pack fits within the same form factor as all previous Fusion Energi batteries, according to Jan De Pena, the global chief engineer for the Fusion vehicle line. The new battery continues to hold 84 individual lithium-ion cells, though it weighs 3 percent more than the previous version. Ford projects that the 9.0-kwh pack in the 2019 Ford Fusion Energi will provide an EPA-rated 25 miles of range, up from 21 miles in the 2018 version. I know that for my next battery pack down the road, I'm certainly going to put a more dense pack in the same space. This "could" be an option. Battery Construction on Energi Vs. Hybrid?